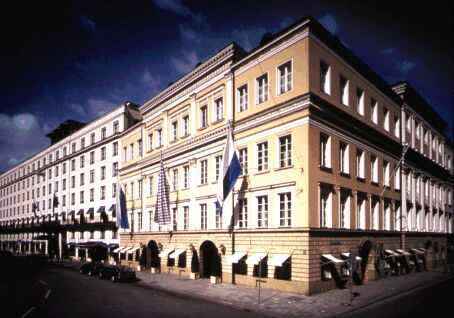 ISCA 2004 will be held at the hotel Bayerischer Hof München, one of Munich's most prestigious hotels. The hotel is located in the heart of Munich at the Promenadeplatz. All prices are without breakfast (20.50 Euro extra). Rooms at the Bayerischer Hof can be reserved by calling the Bayerischer Hof at +49-89-2120-0. Mention IEEE/ISCA to receive the conference rates mentioned above. The deadline for room reservations is May 7, 2004. After that date rooms may still be available at the same price, but are subject to availability. Several hotel alternatives are available (all within walking distance of the conference hotel). These hotels can be booked during the registration process for ISCA. The deadline for room reservations is May 19, 2004. After that date rooms may still be available at the same price, but are subject to availability. All tours can be booked during the registration process for ISCA. Bus tour through Munich passing by the most important sights such as the Angel of Peace, the Residence, the City Hall and the Cathedral of Our Lady with guided tour of the beautiful Nymphenburg Palace which was built from 17th - 19th century as a summer residence for the Bavarian kings. Exciting excursion to Neuschwanstein Castle which through its unrivalled beauty appears like a setting lout of "Sleeping Beauty". Guided tour of the castle, 3 course lunch nearby Hohenschwangau, return trip to Munich including a visit of the world famous Wieskirche (church).